Reports streaming are that Arsenal winger Theo Walcott could be back earlier than the estimated three-month lay-off length. The English youngster injured his shoulder during training ahead of his country’s recent friendly with Germany, and despite medical officials ruling him out of football until February, there is a likeliness that Walcott could be back in a month-and-half at least. Following a successful operation to repair the damaged shoulder ligaments, Walcott’s surgeon is now confident he could be back by the end of January. A close source claims the 19-year-old is known to be a quick healer of injuries, and that can only be splendid news to most anxious fans. With Walcott’s absence an inclusion, Arsene Wenger has a pile of injury worries to contend with and since several are yet to return, there were concerns whether some of his youngsters – already benefiting from injuries to first choices – will still feature in their usual Carling Cup stage. Players like Song and Djourou who are regulars in the competition have already toiled with first-team duties, and Wenger has clarified they are certain to be rested. The latter of the pair left wounded at Stamford Bridge. Djourou’s hip problem has made veteran Silvestre a definite starter tomorrow against Burnley. The boss has confirmed the French defender, including the likes of Vela, Wilshere and Ramsey will all be played. Amaury Bischoff is a possibility but Jay Simpson who scored a brace in the previous round could be dropped for Adebayor’s deputy, Nicklas Bendtner. “It will be the usual team for us,” Wenger said on Monday. “But then with all the players we have out it may be even younger than before. “The players who were on the bench at Chelsea will be involved, but those who started will not. “That means Silvestre will play and so will Fabianski of course. 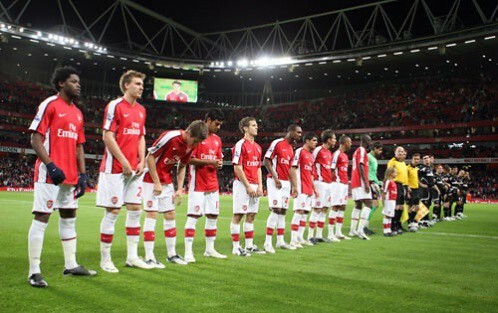 We have some other first-team players [who] will play too – Vela and Bendtner.